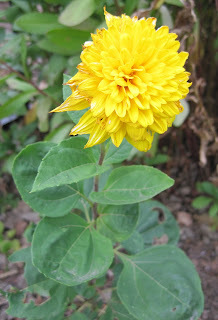 I found this flower blooming in my garden. There is just one flower, on one stem. I didn't buy it. I looked through my notes on trial plants I received this spring and can find nothing about a plant like this. I have no idea what it is. It's not a mum, maybe it is a type of confused sunflower? (Shrug) I guess I'll just enjoy it. I found these bulbs while digging in the garden. My first thought was, "Frass! I didn't mean to dig those up!" Then I remembered that they are probably bulbs for dwarf narcissus that grow about six to eight inches tall and they are planted in the middle of the perennial flower garden where they invariably get lost among the other plants. I want to plant some dwarf narcissus near the path I created through the new woodland garden. 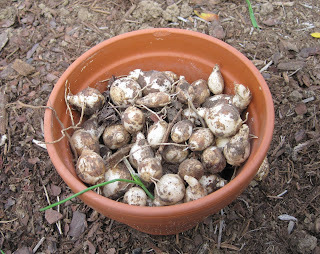 Now I'm thinking, "Isn't it wonderful how I dug these bulbs up to plant someplace else? If I'd gone looking for these bulbs, I probably would have had to dig a dozen holes before I found them." I guess it was just my lucky day. I found more blooms on my Symphyotrichum oblongifolium. 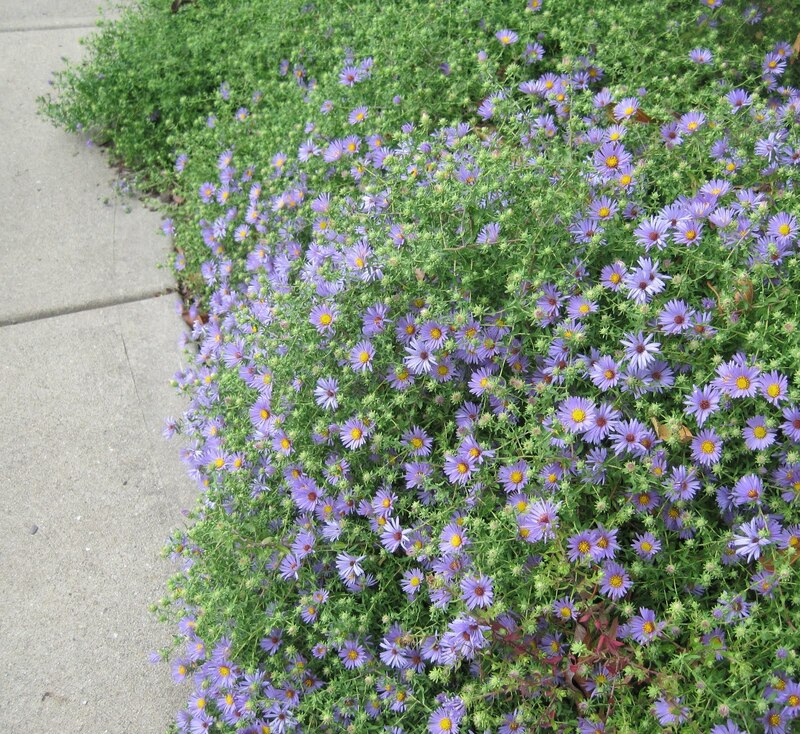 Let's all practice saying "Symphyotrichum" instead of Aster. Say it? Let's learn to spell it first. This is one of those names that I don't think is going to catch on at the garden center anytime soon. I guess we don't have to use it. maybe it's some kind of dahlia? It looks like a sunflower to me by just the leaves especially the pink veining. maybe a bird dropped it off ? whatever it may turn out to be it sure is nice especially for being a free plant :). I searched some more found Helianthus x multiflorus. to me appears to be what it is. Symfiot, simphiort, symphony trick chum oblong foliage. Looks very dahlia-like to me too. Serendipity in the garden - one of the things I love most about gardening! Endless surprises are a hallmark of gardening don't you think. 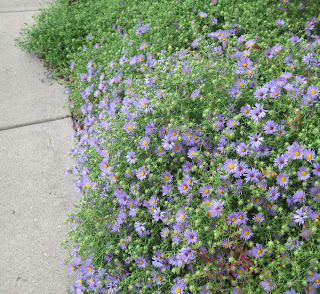 Your aster, ahem, Symphyotrichum looks divine. That sure looks like a dahlia flower to me. It's small enough it could be one of those seed dahlias that rode in on another plant. I'll sit in time out with Frances. I love linguistics but this new botanical name is a tongue twister. Oblong symphony aster! Looks so much like dahlia to me..
An aster by any other name....this one looks glorious. I second Ben's ID on the sunflower. The leaves are all wrong for a dahlia. Whatever that yellow thing is, it sure is cute. Makes sense if it's a sunflower, squirrels and chipmunks don't usually drop Dahlia seeds in the garden. I like aster. Just sayin'. Oh good grief, I've only just got over my aster aversion - even bought one to brighten up my patio. Now they're trying to change the name?! No!! !